A steady stream of monthly data. Switch plans at any time. Earn $1 in credit for each share. Stay on top of your game with a you can rely on. Live with a constant connection you can rely on. Your best work may come outside your company's four walls. With Pulse, you can make sure you're always connected with a steady stream of data wherever you work. The Karma app for iOS and Android makes managing your data easy. Spending time on your commute doesn't have to be time wasted. Pulse can give you an extra supply of data each month that you can use to be productive, or have fun. What's on your plate next might be mystery, but with Pulse, you can knock internet off your list of worries, and concentrate on doing your best work yet. Only pay for the data you want. Earn 100MB when a guest connects to your Karma Go. Go Premium at $10/mo for the first month. 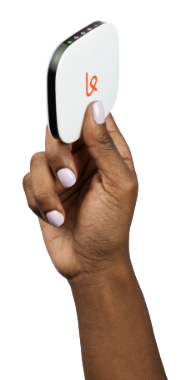 Get yourself online with Karma Go, the pocket-sized WiFi that goes where you go. Manage your account and data on the web or with our iOS and Android apps. You’ll be at ease with no contracts or hidden fees. Cancel or switch at anytime. You’ll feel good and earn data when someone gets online with your Karma Go. Both options turn a 6-8Mpbs LTE connection into your personal WiFi signal. Get the most out of your Karma Go with a growing list of Premium Features. Karma Go runs on 4G LTE with support for Sprint Spark and fallback to CDMA (3G) on Sprint. Did you want to pay-as-you-go? See Karma Go up close.